This Greek chopped salad has a summer time taste that pairs well with grilled meats or fish and it makes a really popular pot luck take along. The salad is full of bite sized ingredients that are so pleasing to the eye. You’ll be transported to the Mediterranean with every bite! What is a chopped salad? The buzzword for salads in many fast food places and trendy cafés lately is “chopped”. But what exactly is this and how is it different from a regular salad? 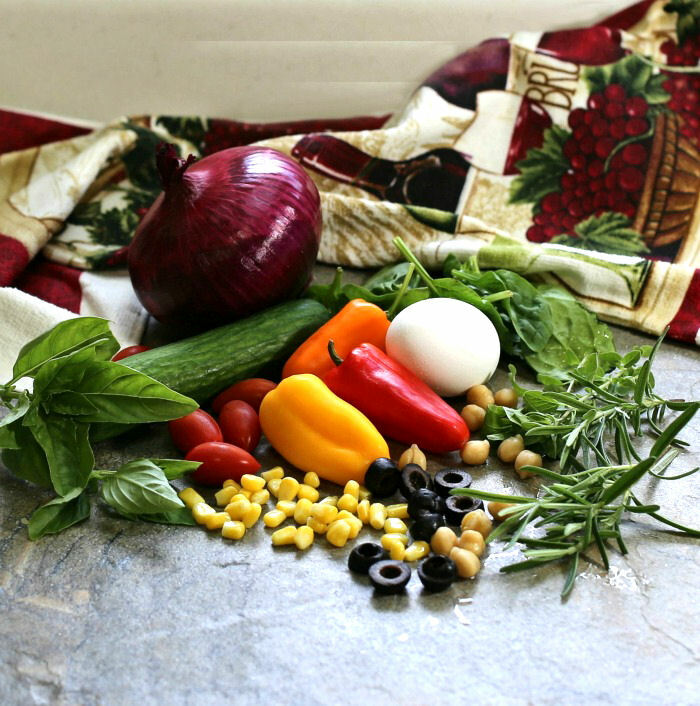 In a regular salad the ingredients are mainly layered with lots of different sizes. Big pieces of tomatoes and small slivers of grated carrots with tossed greens is a normal look. For a chopped salad, most of the ingredients, sometimes even the greens, are chopped so that the salad has a more uniform look to it. Well, I have to say that the chopping of the greens part is not my favorite look, so I go lightly on this part. But the organized side of my brain likes to look at the rest of the items all lined up and tidy looking before it gets all tossed together. I hate it when a salad bar has huge pieces of vegetables in it that makes me end up needing a knife and fork to actually eat the darn thing. Not so with this tidy chopped salad. One of the beauties of any salad is that I can use what I have on hand. And since my husband loves Greek flavors, I can normally put together a Greek chopped salad that has a a distinct Mediterranean feel to it. 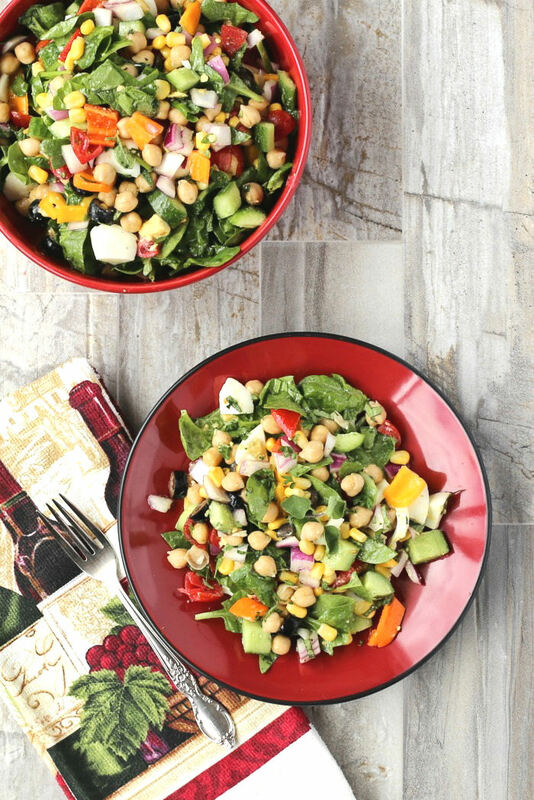 These veggies are full of heart healthy vitamins and minerals and will add so much freshness to this salad! Today, I chose chick peas, onions, baby tomatoes, baby cucumbers, corn kernels, cooked eggs, sweet peppers, olives and baby spinach. I love easy recipes and this one is as easy as they get. Even taking the time to make the dressing and chop the veggies this chopped salad is ready is ready in about 15 minutes or so. Start by chopping your vegetables into evenly sized pieces. 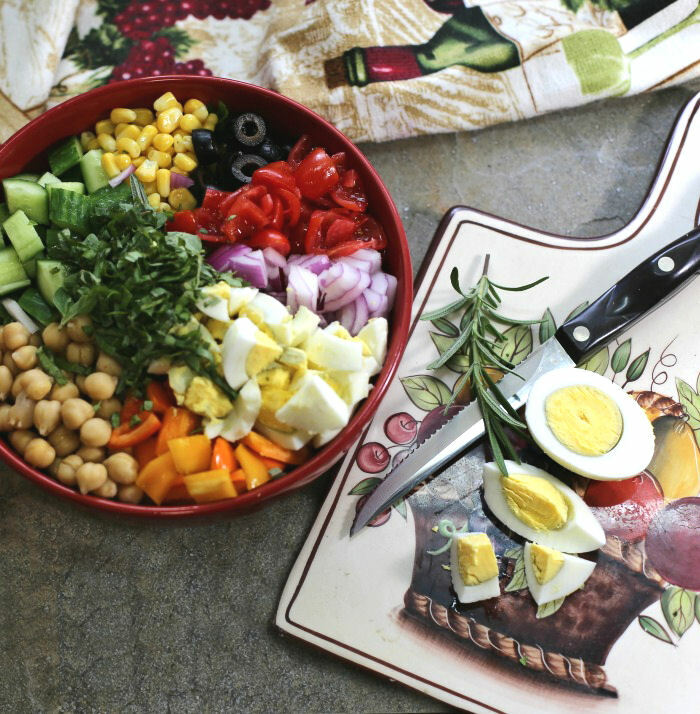 When you have finished the salad, it needs to look uniform with all the veggies being evenly sized. That is one of the biggest appeal of a chopped salad! Tip: The salad will be less watery if you take the time to seed the tomatoes and cucumbers. Look how pretty and colorful these veggies are! I can’t wait to dig into it. 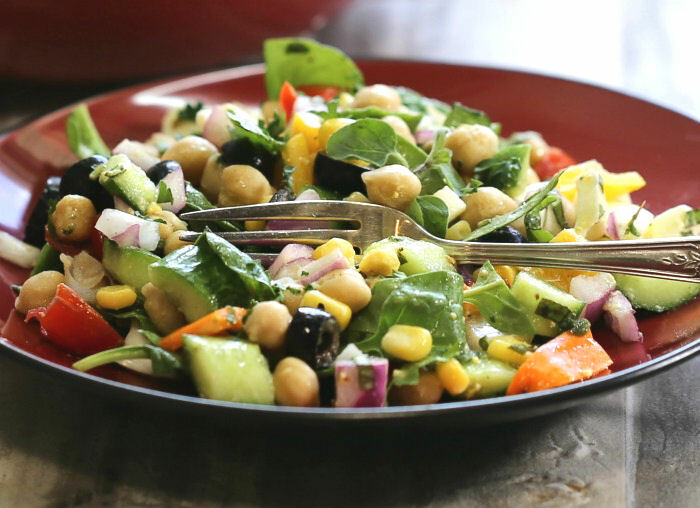 The dressing for this vegetable chopped salad is made from red wine vinegar, light olive oil, the juice of one lime mixed with fresh oregano, sea salt and cracked black pepper to taste. No blender is needed – just a quick whisk in a bowl does it! How easy is that? Pour the home made dressing over the salad and give the whole thing a good toss to let the flavors combine well. 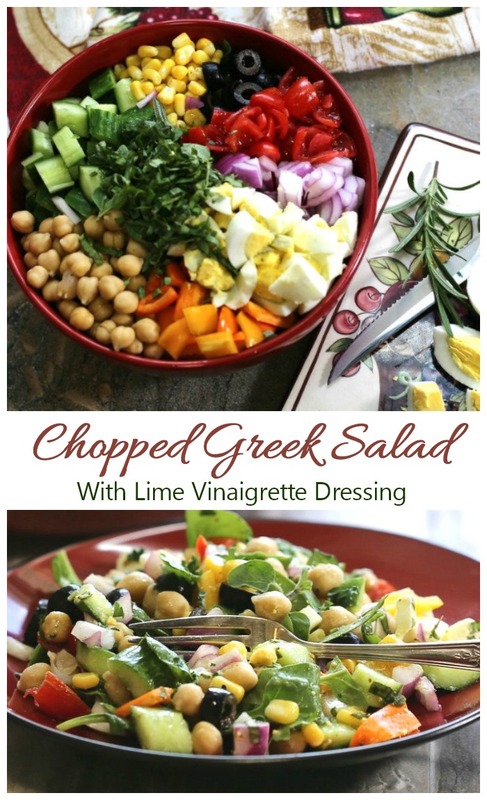 This delicious Greek chopped salad is a breeze to make and the lovely lime and herb dressing gives the veggies a really tasty boost that is both tart and tangy with a smooth finish from the light olive oil. 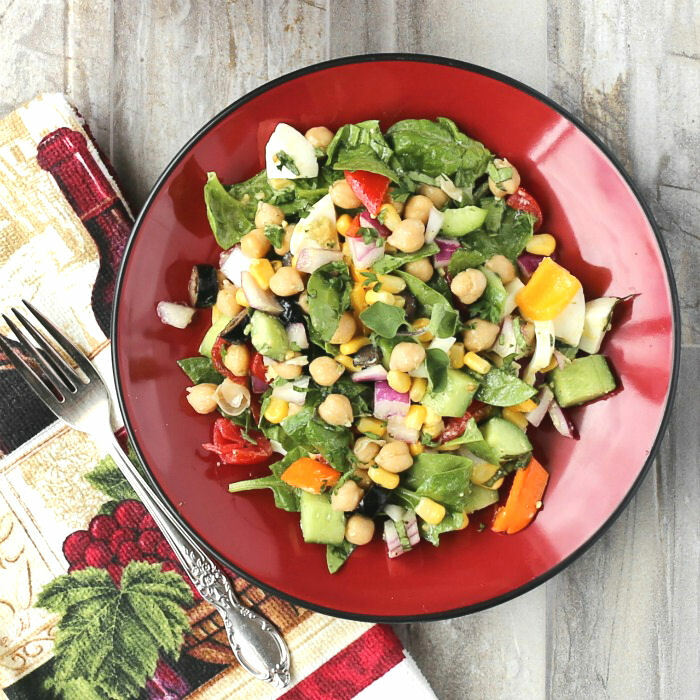 This may appear to be just a simple salad but with the abundance of veggies, chick peas, olives and corn, all tossed with a tangy lime-herb vinaigrette, it is brimming with flavor and sure to satisfy those times when you have a craving for Greek food! 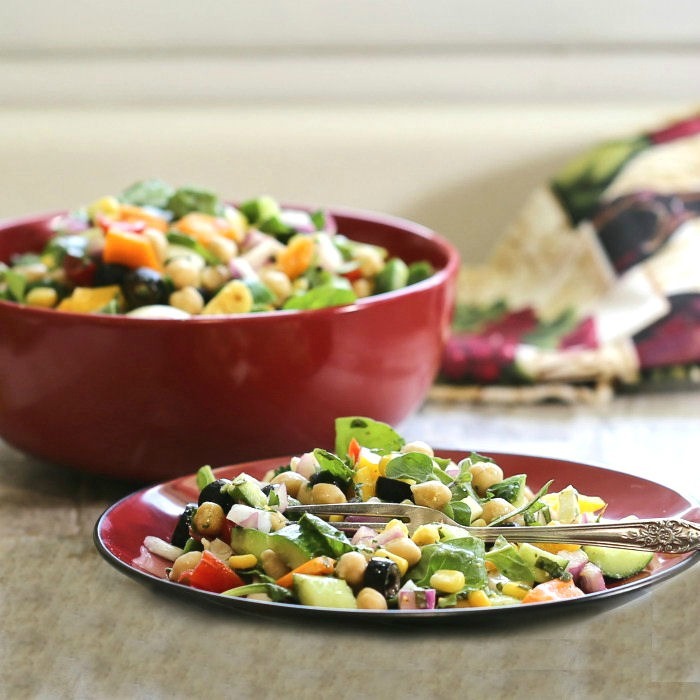 The tasty Mediterranean chopped salad is made from just a few fresh ingredients but it packs a flavorful punch. It is the perfect summer time side dish to go along with grilled meat and is also lovely with roasted chicken in the winter. It is one of my go-to salads. Take it to your next summer pot luck dinner and watch the bowl get cleaned in a flash. The nutritional information for a chopped salad depends on the amounts of each item and what you choose to put into the salad based on your preferences. I chose to make mine dairy free, so I omitted any type of cheese (Feta cheese is often used in Greek Salads). 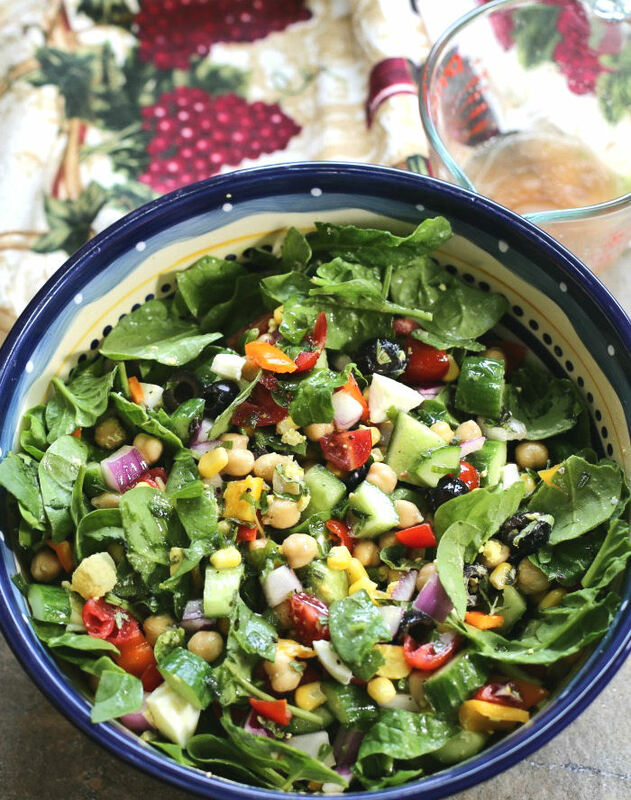 This salad serves 4 and works out to about 295 calories. With the dressing, it is dairy free, gluten free and high in protein and fiber. It is heart healthy eating at its best. If you would like to find this salad later to remind you, pin this image to Pinterest. This tasty chopped Greek salad is full of bite sized ingredients that transport you to the Mediterranean in every bite. 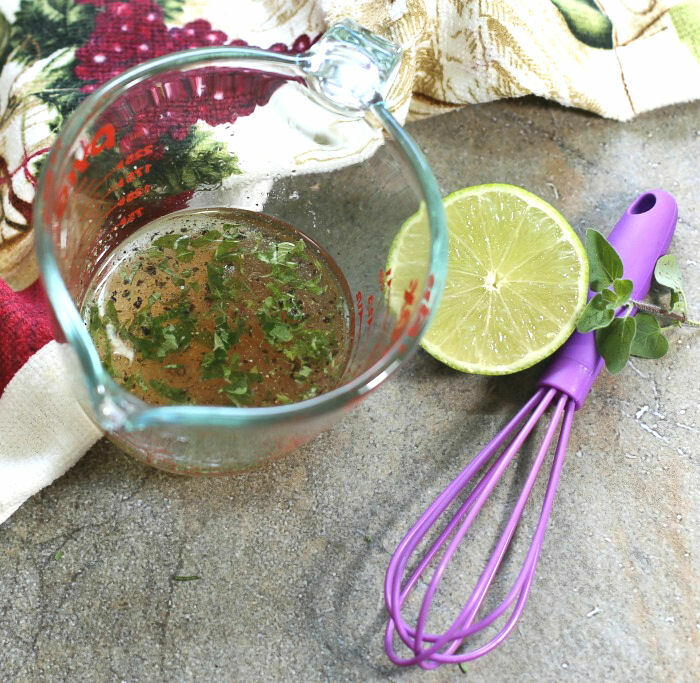 To make the dressing, combine all of the salad dressing ingredients in a small bowl and whisk to combine. Set the dressing aside. Dice the cucumbers, tomatoes, sweet peppers, onion, olives and hard boiled eggs so that they are roughly all the same size. Very lightly chop the baby spinach and place it in a serving bowl. Put these vegetables with the corn and garbanzo beans on top of the baby spinach and add the chopped fresh herbs. Pour over the home made dressing and toss to combine. You can eat this immediately but I like to make it early in the day and then refrigerate for an hour to let the flavors combine well. Serve with grilled meat or fish for a tasty summer side dish. Tips: Take the time to seed the tomatoes or cucumbers for a less watery mix of veggies. Also, if placing the salad in the fridge to marinate, add the spinach just before serving so that it does not get soggy.